2-CD with 28-page booklet, 48 tracks. Playing time approx. 126 mns. 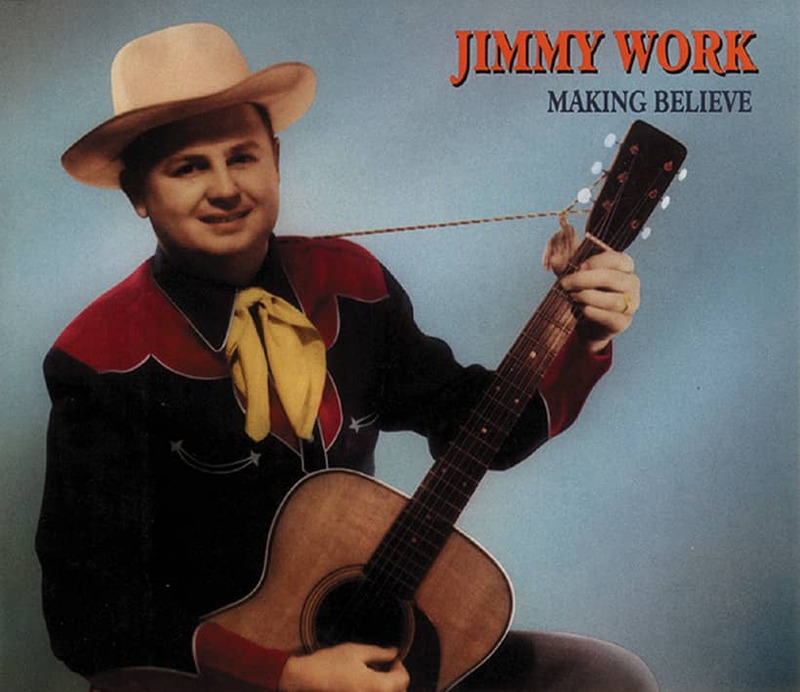 These 48 tracks comprise everything that Jimmy Work recorded between 1945 and 1959. Hillbilly music comes no purer or finer. For country soul, Jimmy can be ranked alongside Hank Williams, and he's nearly as great a songwriter, too! Here are the ultra-rare original recording of Tennessee Border alongside all of the classic Dot, Capitol, Decca, Bullet and London sides, including Making Believe, That's What Makes The Jukebox Play, Just Like Downtown, Let 'em Talk, My Old Stomping Ground, and That Cold Col Look In Your Eye. When Jimmy Work recorded for Bullet in 1949, his standing in the business was about as high as it would get. He had written the smash hit Tennessee Border, and was hoping that it would put a charge behind his own recording career. Like the York Brothers, Work had left the rural mid-South for Detroit, and like them he had recorded for some local labels there. His story has been recounted in depth on the Bear Family retrospective 'Making Believe' BCD 15651, so we can recap briefly by saying that he was born in Akron, Ohio on March 29, 1924, but grew up literally on the Tennessee Border in Dukedom, Tennessee -- just south of the Kentucky line. He moved to Detroit in 1945, and recorded Tennessee Border for Alben Records in 1948. It was covered by Red Foley, Ernie Ford, Bob Atcher, and Jimmie Skinner. Tubb and Foley later took an answer version into the charts, leading to Work's contract with Decca. After three shots on Decca, Work was cast loose, and ended up on Bullet around October 1949. Like many of Work's recordings, Hospitality painted an idealized portrait of rural living, but Work was at least true to his credo and moved back to Dukedom. The next best shot came in 1955 when Kitty Wells and several others covered Work's song Making Believe. He was on Dot Records by then, and both his version and Kitty's version got into the Top 5. The follow-up, That's What Makes The Jukebox Play, got to #6, and was revived successfully by Moe Bandy in 1978. At last sighting, Work was still in Dukedom. Customer evaluation for "Making Believe (2-CD)"